​​Born in 1961, Art grew up frequently attending opera house concerts listening to his mother sing magnificently with the Seattle Symphony Choral. By the age of 16 he had been to over 40 concerts yet by the age of 11 was already inspired to learn to play the harmonica. Starting with “Oh, Susanna”, Art learned every campfire folk song he could, and by the time he was 20 he was studying harmonica greats like Lee Oskar, Sonny Terry, and Little Walter.In 1981, Art majored in music at The Evergreen State College in Olympia, WA studying Blues history, composition, theory, harmonica, recording arts, and live performance by forming his first nightclub 5-piece R & B band. “The Midnight Rhythm Band” played 3 years at venues throughout western Washington, recording for college compilations, and playing live on KAOS radio. During this time, Art recorded his first harmonica instrumental, a high-energy Rock-a-Billy tune called “Black Dog Stomp”, which enjoyed local airplay. 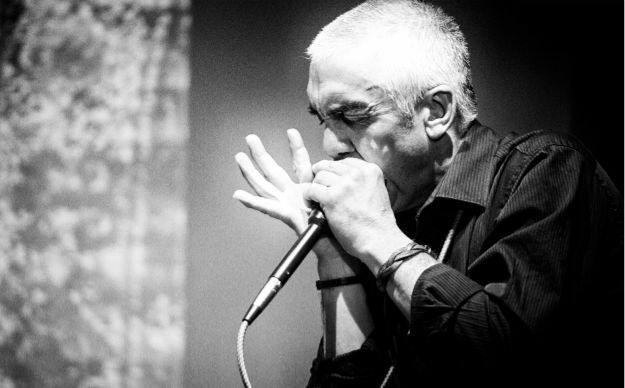 After more than a decade of playing in Northwest R & B bands, life drew Art to Arizona in the early nineties where he lent his harmonica talents to the high-powered Blues band “Blue Z”. There, in the venues of Northern Arizona, Patience pushed his limits to create the raw – yet soulful – player he is today. The band played full time at venues including Chars Has The Blues and The Rhythm Room in Phoenix, as well as recorded a soundtrack for a PBS travel documentary “Planet Of Dreams” with Kris Kristopherson as musical co-writer. Returning to the Northwest in the mid-nineties Art began performing regularly with world-renown pianist Scott Cossu. Challenged by Scott’s innovative song writing, Art expanded his techniques and repertoire by milestones. Boasting nearly 200 shows with Scott in 20 years, Art has learned the “ins and outs” of touring and performing live in well-known venues such as Jazz Alley in Seattle, The Sheridan Opera House in Telluride, Swallow Hill in Denver, and The Steamplant Performing Arts Center in Salida, CO. In addition, Art is featured on Scott’s “Jazz, Boogie, And Deja’ Blues” recording on Summit Records. Throughout Art’s musical career he has continued to write instrumentals and in 1999, inspired by the ambient tones of the harmonica and the sounds of nature, he recorded his first solo album “Spirit Of The Woods” on the Howlin’ Dog record label, gaining regional Colorado attention. After listening to the album, Lee Oskar invited Art to join his harmonica sponsorship program while quoting, “Art’s harmonica sings straight from the heart”. Art’s performance will include music from his album The Recognition along with some blues tunes and improvs.